Disclosure: This post is sponsored by Hill’s® Science Diet® and the BlogPaws Professional Pet Blogger Network. I am being compensated for helping spread the word about Hill’s® Science Diet® Feline Urinary Hairball Control food but Found Frolicking only shares information we feel is relevant to our readers. Hill’s® Science Diet® is not responsible for the content of this article. Cats are the most common and most popular animal companion in the world. Approximately 37% of the population in the United States has a cat in their home. With their alluring combination of an affectionate and simultaneously independent nature, it's not hard to see why. Perhaps your own home is one of the many households that consider their animal companions to be a member of their family. As parents, we all work tirelessly to always provide the best home and care for our children, and we do our best to care for our household pets, too. Providing your feline companions with a diet that promotes optimal health is now easier than ever with the Hill’s® Science Diet® Urinary & Hairball Control formula. Did you know that your cat having litter box issues can be related to urinary infections and other health problems? 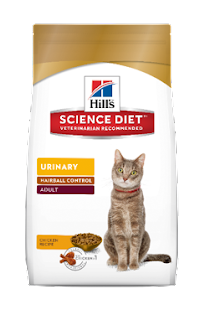 Hill’s® Science Diet® Urinary & Hairball Control formula can help prevent the problem before it occur. 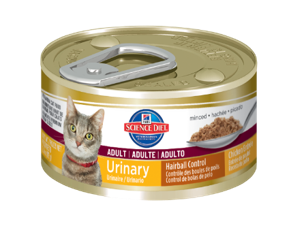 Formulated to support the whole urinary health system, the Hill’s® Science Diet® Urinary & Hairball Control formula provides your cat with optimal levels of magnesium that keep them healthy from their kidneys all the way down to their bladder. Natural fiber in the Hill’s® Science Diet® Urinary & Hairball Control formula helps avoid hairball formation in healthy adult cats. Hill’s® Science Diet® Urinary & Hairball Control formula has just the ingredients needed to keep your cats happy and healthy! Coughed up hairballs and urination outside of the litter box are at the top of most peoples' list of undesired behaviors in their family's cat. The Hill’s® Science Diet® Urinary & Hairball Control formula is the only food on the market that addresses both of these common issues in healthy cats. You can find this amazing product at Petsmart and even online at Petsmart.ca. There are also a few tips to keep in mind about your cat's litter box to keep your feline companion happy and avoid unwanted urination outside of the litter box. - The general rule of thumb for litter boxes is that you should have one litter box for each cat in your household, and one extra litter box "just in case." So if you have three cats, you should maintain four litter boxes. - Clean out soiled litter every day. It's not a chore that anyone enjoys, but the job has to be done! Make the job easier on yourself by keeping a small trash can or specially designed litter bin handy for convenient disposal. - Try a different type of litter. Litter boxes already don't smell great to us, and cats have a much better sense of smell than we do. It's not hard to see why they wouldn't want to use a smelly, soiled litter box. Experiment with different types of litter to find one that works for your cat and better controls the odor and provides maximum absorbency. - Keep them hydrated. Cats are infamous for not drinking enough water, but over a long period of time, cats who don't drink enough water can develop crystals. Getting a pet fountain is a great way to encourage cats to drink more water. They can always hear the sound of the fountain running, which, in my experience with a number of cats, reminds them to drink throughout the day. And of course a healthy, nutritious diet is necessary to keep them at their best and prevent any issues, too. 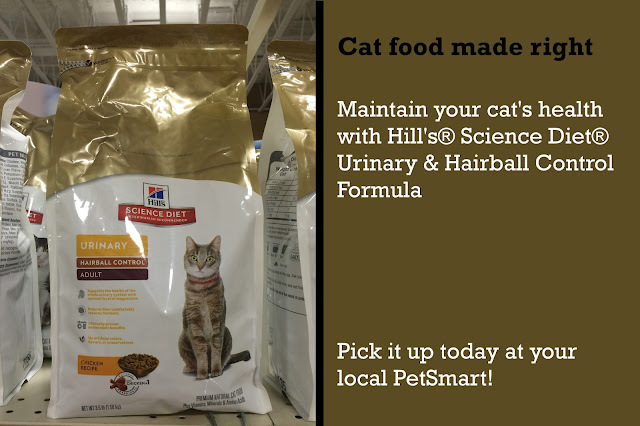 Look for the Hill’s® Science Diet® Urinary & Hairball Control formula at a PetSmart location near you! Disclosure: This is a sponsored post. I received monetary compensation in exchange for writing this content. All opinions expressed are my own, and were in no way influenced by the brand or any other sources. The post and all photos with the watermark are the property of Found Frolicking, and should not be used or distributed in any way without first receiving permission. Found Frolicking is in no way responsible for prize shipment, but will work with the sponsors in all ways possible to ensure the winner receives their prizes. When our dog, Lokii was still with us, I remember trying out Science Diet before we switched to home cooked meals for him. It's pretty nice, I would guess it's the same for cats. I'm sure my cat would love it, it sounds like a great product, and I think my cat will be healthy and keep her diet. I've always heard this brand and it's really healthy for cats. I'd like to spread this into my frineds whose have a cats. Wow, I didn't know all of these issues, especially regarding developing crystals due to dehydration. I'm going to be paying more attention to my little ones' health. Thanks! Science diet is a good brand of food. They even make special recipes for different ailments too. The special recipes have to be purchased your vets office. This sounds like a great cat food for any cat and I will have to share this with my brother. It is better to prevent these thinks from happen rather than treat after they happen. I am going to recommend this to my brother for his cat. He is always getting sick off different brands.